Whether you have to dig through the back of your closet to find them or have them on constant rotation, you'll want to grab your favorite skinny jeans because they're about to become your favorite winter essential. 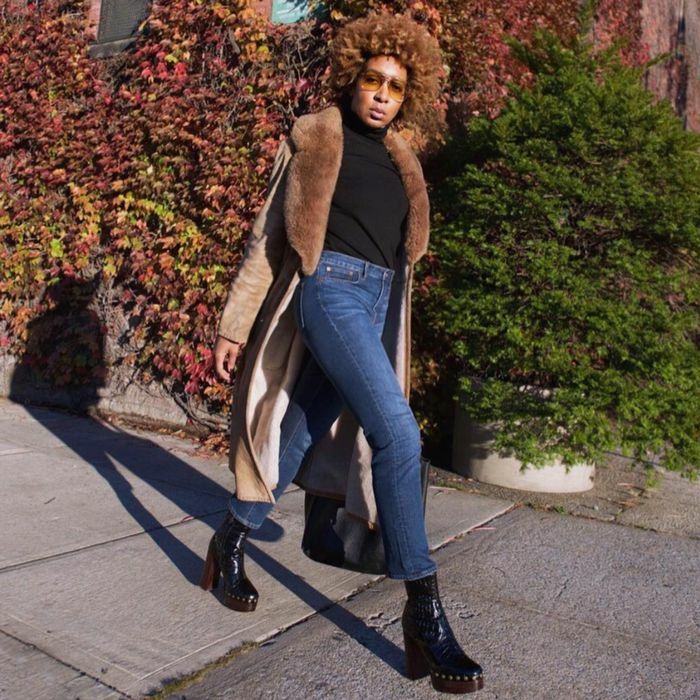 With bulky outerwear such as puffer coats and faux-fur coats trending, skinny jeans make the perfect addition to your outfit for the most flattering winter wardrobe. We could wax poetic about slim-fitting denim, but we have a feeling you already know and love it. Which brings us to our next topic: shoes. We fully believe that the key to making the denim reach its full potential in the winter is the shoes you wear with skinny jeans in cold weather. And with winter fully set in, you need shoes that are not only stylish but practical and warm enough to get you through even the coldest, wettest days. Ankle boots can be tricky with slim jeans (to tuck or not to tuck? ), so we ventured out to find 10 pairs of cozy winter-appropriate boots (including ankle styles), sneakers, and heels to wear with your favorite skinny jeans this winter. Keep scrolling to shop the shoes that will make your skinny jeans look incredibly stylish this winter (along with specific pairs of jeans to wear with them, if you're so inclined). 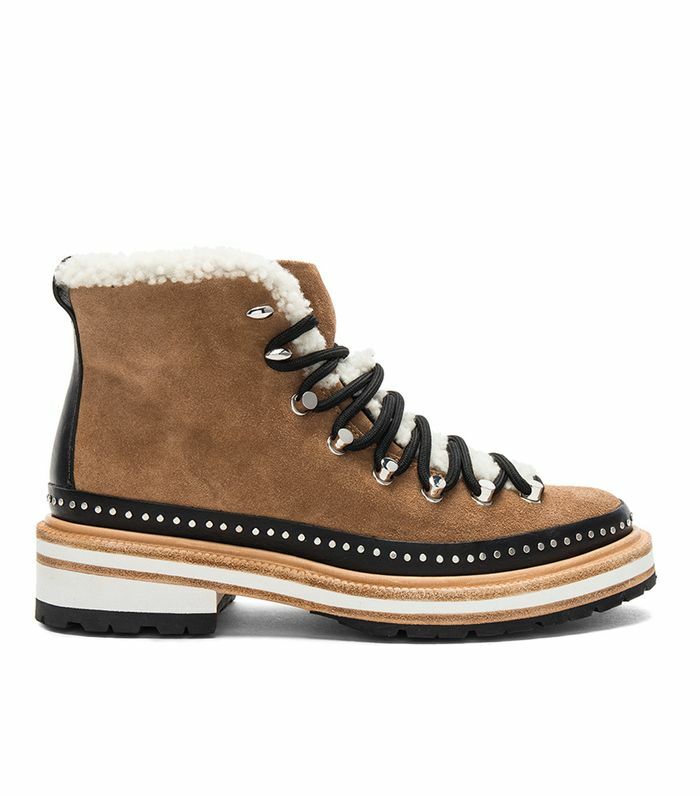 Rain, snow, or shine, these shearling boots are the ideal winter shoe. While there are endless paring possibilities for these everyday boots, opt for medium- to light-wash super-skinny jeans that will fit perfectly into the top of the boots. Swap your black boots for these beautiful maroon leather boots for unexpected winter shoes. Pair with dark-wash skinny jeans to master the look. Take your sneaker game up a notch with sherpa-lined sneakers—cute and cozy. Pair with ripped light-wash skinny jeans for a laid-back look. Pair classic combat boots like Dr. Martens with simple, sleek black jeans and a puffer coat for the perfect winter outfit. Switch out your summer sandals with velvet pumps this winter. Pair with frayed skinny jeans for a chic look. Pair classic over-the-knee boots with black jeans for a monochromatic, chic outfit. Add a fur coat for the ultimate winter look. Add texture to your winter wardrobe with these square toe crocodile boots. Pair with ankle crop skinny jeans for a seamless look. Try a spin on the classic Chelsea boot with this heeled, suede pair from Topshop. Wear with ripped jeans for a chic yet casual winter look. Animal print is trending this winter and these snakeskin boots are no exception. Pair these statement boots with medium wash skinny jeans. Loafers are a great alternative to boots for the winter. Try a platform pair with skinny jeans to elevate your look. Want more skinny-jean inspiration? Check out the best skinny jeans at Nordstrom.